We’ve tested a number of Aquapac products and all are high spec, well manufactured that any type of stand up paddler will find good use for. Some will find favour as additions to kit boxes that stay ashore, while others, such as Aquapac’s Waist Pack, reviewed here by Rich Heathcote, is worth a look for paddlers wanting a functional piece of wearable storage when afloat. Over to Rich for the low down. 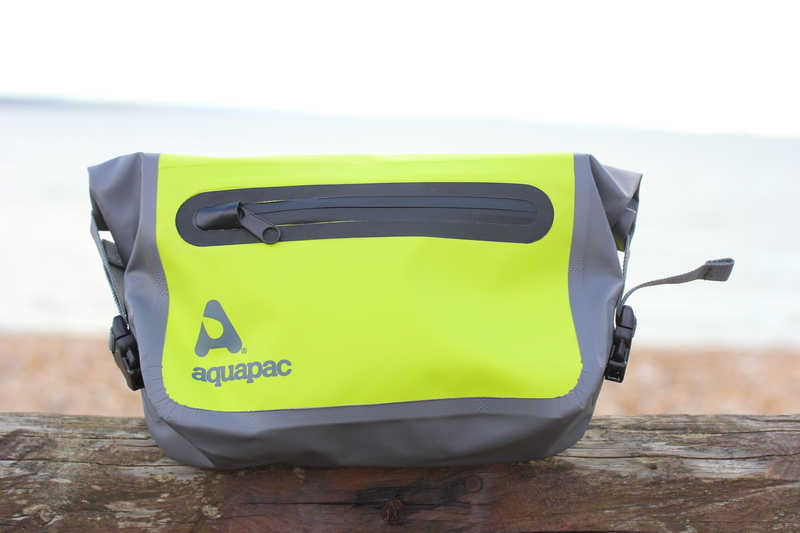 ‘The Aquapac Waist Pack is a really well made piece of kit with several technical features. It looks good in grey and lime green – standing out but not in an offensive way. The strap is very comfortable and secure with a mesh padded belt and supported with a sturdy clip that’s easily adjusted. The outside pocket is big enough for snacks or car/van keys and the zip seems to be well sealed, although I don’t think I’d trust it with my phone. If you’re thinking of taking this with you then make sure it’s in a secondary waterproof pouch. The main storage area is roomy without making the bag feel cumbersome and you could easily fit essential food fuel or additional apparel layers, such as soft shell top, without any problem. It folds easily, though I couldn’t quite see the point of the line of Velcro across the back – this seems unnecessary. The double clips are easily attached and the whole bag is robust, versatile and waterproof. I tested it by submerging a few times and everything inside remained dry. This is great if paddlers take an unplanned dunking. As long as you’ve sealed the Aquapac Waist Pack properly then your stuff will remain moisture free’. ‘Overall Aquapac’s Waist Pack is a great piece of gear. It is far easier to paddle with a bag like this around your waist, rather than a rucksack on your back. The only addition I feel would be good would be a pouch for a water bottle on the waistband which would make it more appealing to racers or those who don’t fancy wearing a camel pack’.